People perform yoga in Vladivostok. 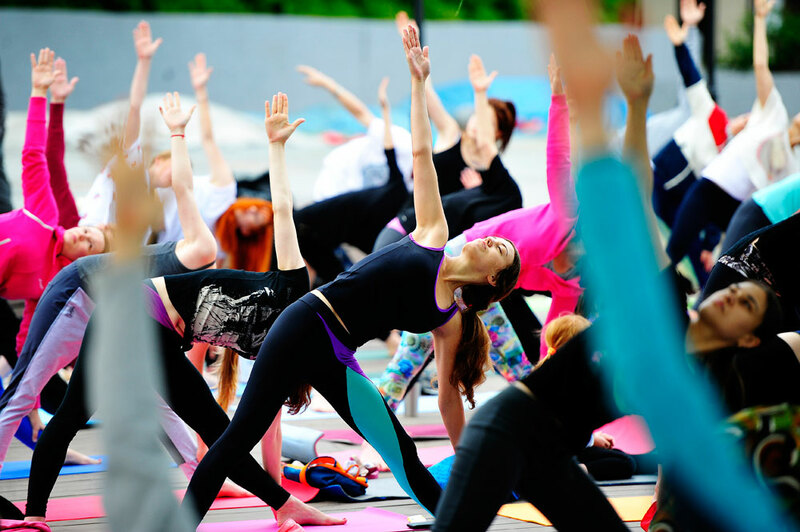 While yoga and healthy eating is increasingly embodying the modern Russian lifestyle, though analysts and experts say the preoccupation with healthy living is typical of only certain social groups. Russia is seeing something of a health craze, with increasing numbers of people becoming health-conscious, preferring yoga to nightclubs, a light dinner at a vegetarian restaurant to a big meal with alcohol, or handmade shampoo to hyped supermarket brands. Valeria has been standing in the ‘Vrikshasana’ (tree pose), a yoga asana (pose) to improve balance, for five minutes. Doing this exercise during the working day helps her to get in the mood for work. Valeria Gorbachyova, an adviser to the Executive Director of the National Committee on BRICS Research, got into yoga relatively recently. "Yoga in a way has become a salvation from everyday routine for me," she said. Yoga's popularity in Russia has rocketed in recent years. Classes are packed. There is a shortage of instructors. However, says Sergey Litau, president of the Moscow-based Yoga Federation, this applies only to Moscow and Saint Petersburg. "According to the latest statistics, roughly 500,000 people practice yoga in Russia," Litau told RIR. "This figure is growing, but not as quickly as, say, in America." For Valeria, yoga has also been useful for her job – after all, India, the birthplace of yoga, is one of the BRICS countries she specializes in. "India is a fantastically interesting country. I hope that yoga will help me to understand it better," she said. "At some point, vegetarianism became a natural way of life for me. I don't even know how I got into it. Everything happened naturally," said Anastasia Tenesheva, a journalist, who became a vegetarian two years ago. The Russian words for "vegetarianism", "veganism" and "raw foodism" entered the lexicon only recently, but, again, have quickly taken hold. "People are now starting to think about what they eat and what kind of lifestyle they lead in general, so vegetarian food is becoming very popular," said Rasa Neapolitanskaya, a management representative at ‘Jagannath’, a chain of vegetarian restaurants and shops, to RIR. The ‘Jagannath’ chain of restaurants is opening new restaurants and stores, despite the economic crisis..
"We get three franchise applications a day from different cities," said Neapolitanskaya. "We're part of a trend. It's fashionable to be healthy now, so interest in us is growing." Yulia Tseshkovskaya has long been interested in what goes into cosmetics. "Having come across a number of positive comments on natural home-made cosmetics, I decided to have a go at making them myself," said Yulia. Her first experience was a success, and Yulia began making practically all the cosmetics she needs at home. Her friends and work colleagues also liked her work. This gave her the idea of making handmade cosmetics to order. "Initially, it was a hobby, but then I set up a hand-made cosmetics workshop, where anyone who wants can order natural cosmetics products made according to exclusive original recipes." Big business has also caught on to the increasing interest from Russians in organic products, and a number of organic cosmetics brands have emerged. Andrei Trubnikov is the most successful entrepreneur in this field, as the man behind Natura Siberica, Organic Shop and Planeta Organica. The economic crisis notwithstanding, Trubnikov's business is doing well, with new products being introduced and new shops opening. Organic Shop now has 16 stores in Russia, and Natura Siberica 6. Yulia hopes to create her own brand eventually. "Today, people need a healthy lifestyle, healthy food and organic cosmetics more than ever. I'm interested in this area, because it's a chance to improve the life of everyone concerned about their health and the environment." Experts that RIR consulted, however, said this preoccupation with healthy living was typical only of certain social groups. According to Ivan Pautov, senior research assistant at the Sociological Institute of the Russian Academy of Sciences, the well-off in Russia are much more likely to pay attention to their health than the less well-off. Most Russians fail to exercise or play sports regularly or eat healthily, let alone buy organic cosmetics, which are simply too expensive for many people. The proportion of Russians who smoke remains at around 40%, while 62% drink alcohol regularly. A third of people of working age in Russia have weight problems. 54% of men and 59% of women are overweight, with 15% and 28.5% respectively obese.